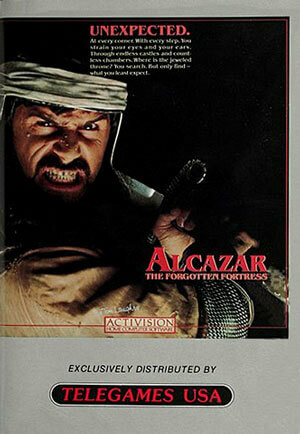 In this adventure game you control an explorer who's on his way to fortress Alcazar. To reach Alcazar you are travelling through a countryside of fortresses and you need to collect several items that you can find along the way. 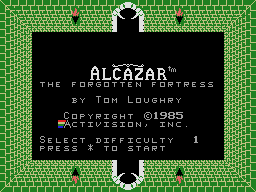 Once you enter the Alcazar fortress you have to search for the crown. The strategy map gives you an overview of the countryside, it's fortresses and your location in it. What perils lurk in these mysterious castles? Which path is quick and safe? The Alcazar castle is three stories high, all other castles have only two stories. To enter a castle you just have to follow the path. 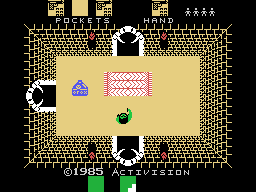 Each castle has it's own sought-after objects and these objects are always guarded by the castles main demon. Objects to look for are for example: a rope, a gun, raw meat, water or a raft. Collect them and use them properly to master the legendary Alcazar fortress. 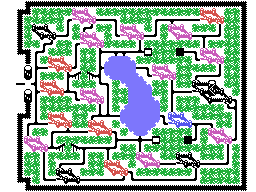 The game gives you clues and tells, for example, which monsters are nearby. Some monsters are really hard to kill. 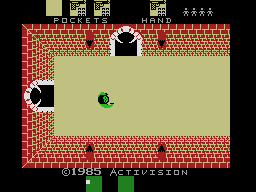 The game can be played at four difficulty levels.